The submarine, designated O-12 in U.S. Naval lingo, measured in at 175 feet long. She was, even by the standards of the early 1930’s, not a particularly impressive sight, with a brief career spent meandering about the then-quiet Panama Canal Zone. Decommissioned on 17 June 1924, she was consigned to the Philadelphia Navy Yard to await scrapping. It was an unremarkable fate for a relatively unremarkable vessel, and were events indeed to play out in this particular fashion, it is doubtful the memory of O-12 would live on past some musty Naval archive. This early and rickety contraption for sailing beneath the waves was, however, destined for greater things, as she became the first machine to take humans past—or rather, beneath—one of the last great unexplored frontiers the Earth has to offer. At first glance, Hubert Wilkins might have seemed an unlikely candidate for a polar explorer. Born in 1888 in balmy Mount Bryan, South Australia, he was the thirteenth child of a family of pioneer sheep farmers. His first occupation—somewhat stereotypically—was that of kangaroo hunter. Young Hubert’s interest in meteorology was piqued at an early age, perhaps as a side effect of a childhood spent in the drought-prone Australian Outback where one’s livelihood often depended on the ability to predict weather and climate. Before long, he emerged as a young man of multiple talents: aviator, photographer, journalist, and explorer. His early adult life was in large part spent beyond the borders of his native Australia, at first accompanying the Ottoman army as a photographer during the First Balkan War in 1912. The following year he embarked on a venture into the polar regions as a part of Vilhjalmur Stefansson’s Canadian-funded Arctic expedition in which several members perished after their ship became stuck in the ice. It was during this expedition that Wilkins first envisioned using a submarine to explore the polar regions, and over the course of the next several years he formulated a plan to turn the concept into a reality. He cemented his reputation as an Arctic explorer in 1928 when he completed a grueling twenty-hour flight from Alaska to Spitsbergen, a pioneering feat of aeronautics that earned him a knighthood from King George V. Wilkins’ accomplishments had by that point also earned him the attention of American newspaper tycoon Randolph Hearst, who saw in Wilkins the kind of gentlemanly adventurism that could potentially become irresistible front-page material. In 1929, Hearst invited Wilkins to a round-the-globe flight aboard one of the technological marvels of interwar Europe, the airship Graf Zeppelin. This made Wilkins, perhaps unbeknownst to himself, the first Australian to embark on a circumnavigation of the globe by airship. While aboard the Graf Zeppelin, Wilkins came up with a suitably grandiose way to attract sponsors to his planned subpolar expedition: Suppose his submarine were to smash through the ice and meet up with the Graf Zeppelin at the geographic North Pole itself? The event would surely become a media spectacle, covering the front page of every newspaper on the planet. Hearst, upon hearing of Wilkins’ plan, was ecstatic, and offered financial backing in the form of $250,000, or approximately $13 million in present-day dollars. This, augmented by additional funds from wealthy adventurer Lincoln Ellsworth the following year, was enough to offer Wilkins a financial base for his ambitious voyage. With Hearst’s newspaper empire at his back, word of Wilkins’ upcoming expedition reached every corner of America, and beyond. Even Walt Disney was exhilarated by the plan, and he sent Wilkins a personal, hand-drawn card depicting Mickey Mouse astride a submarine’s ice-encrusted conning tower. For the symbolic sum of one dollar per year, Wilkins leased a decommissioned submarine from the U.S. Navy, an antique World War I-era O-Class boat—O-12. He recruited a crew to man his newly acquired vessel, and set about retrofitting the aging submarine with a battery of scientific instrumentation and technical add-ons. In a disturbing omen of what is to come, the modifications were the product of guesswork rather than experience, as the shipwright has never before produced vessels fit for Arctic waters. In 1931, after a year’s worth of work, Wilkins’ boat stood ready. The exterior modifications had turned the old O-Class submarine into a peculiar and unconventional underwater vessel, bearing little resemblance to the obsolete vessel from which she was built. Among the additions was an upward-facing drill that would enable the crew to bore through ice and escape in case of an emergency. A heavy-duty shock absorber was attached to the nose of the vessel, intended to soak up the impact of drifting chunks of ice. A large hydraulic “tongue” was installed behind the conning tower, designed to brace itself against the ice above in a crude form of collision avoidance. Large wooden skids were mounted on top of the hull, intended to deflect ice when diving and underwater. One of the more novel ideas saw the torpedo room converted into a pressure chamber, allowing the scientists onboard direct access to the outside ocean via a hatch in the hull. 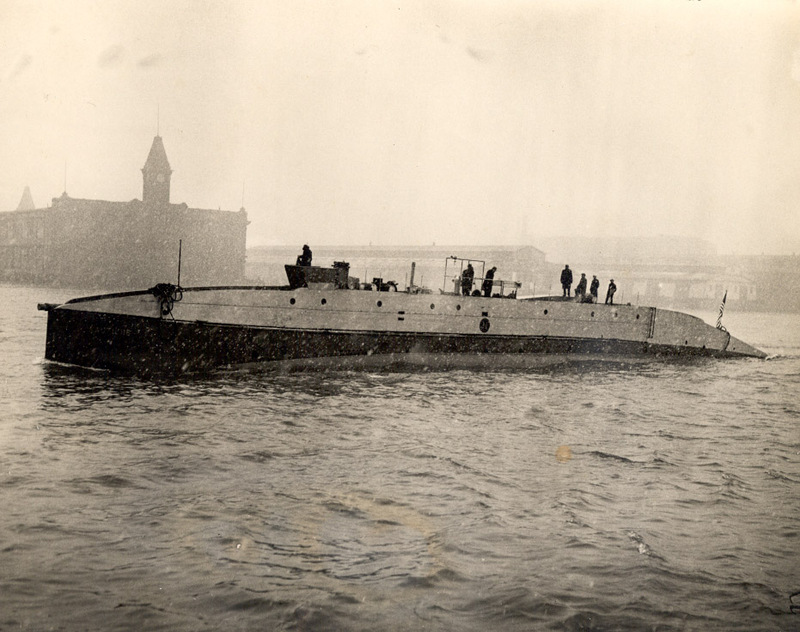 The first of many problems to come revealed itself as the Nautilus began her sea trials, when the submarine accidentally plunged below her maximum depth. The crew finally emptied the ballast tanks, and the Nautilus surfaced, though the massive exterior pressure had resulted in damage that needed to be repaired before she could venture any further. The expedition lagged behind schedule before it even began, and the newspapers that had once been so enthusiastic about his ambitious voyage began to direct surly criticism at Wilkins, whom they accused of being a reckless risk-taker. The criticism wasn’t without basis, as the old and relatively unreliable Nautilus gave rise to the uncomfortable possibility that the submarine might become the crew’s grave. Finally, the Nautilus and her twenty-man crew, including Wilkins, departed from New York. The first port of call: Plymouth, England; then Bergen, Norway; and then onward to the North Pole via Spitsbergen. It was a daunting journey that was going to take some four weeks, assuming everything went well. The delay caused by the repairs had also had the unwelcome side effect of turning the venture into a race against time. Before long, vicious autumnal storms would engulf the Arctic, meaning that the expedition’s window of opportunity was closing with alarming rapidity. The antiquated technology of the Nautilus also meant that spending lengthy sessions underwater to ride out bad weather—as modern submarines are able to do—wasn’t a reliable option. The O-Class submarines, built in the late 1910’s, came from an era when submarines were still primarily designed as surface vessels, and as such were only capable of submerged travel in relatively brief stints. At just one week into the trans-Atlantic trek, the Nautilus encountered rough seas. The crew suffered from violent seasickness as the submarine rolled up to a hundred degrees in the massive waves. Worse still, the engines cut out. The crew attempted repairs once the storm died down, but the necessary spare parts were not onboard. Some amongst the crew began to harbor second thoughts—the realization sunk in that the submarine that was supposed to take them beneath the Arctic ice and back was in less-than-optimal condition. Adrift in the middle of the Atlantic Ocean with no engine power, the crew had no other option but to send out an SOS and hope that someone was listening. By chance, the dreadnought USS Wyoming was in the vicinity, and she steamed to the aid of the Nautilus. The warship offered to tow the vessel to England, though the crew of the Nautilus stood divided. Some wanted to see the mission through, while others—unconvinced of the Nautilus’ seaworthiness—wanted to depart at the next port of call. The Wyoming finally delivered the stricken Nautilus to the British Isles, though the submarine was once again in need of extensive repairs. Wilkins was at that point justifiably worried that they wouldn’t be able to reach the Arctic before winter set in, and his troubles only increased as another precious month was lost in dry dock. The Nautilus finally left dry dock and steamed north. This time the journey from Plymouth to Bergen was mercifully free of incidents and technical failures. Once in Norway, final preparations commenced for the voyage under the ice as supplies and scientific instrumentation were brought onboard. New crew members joined in, amongst them, Harald Sverdrup of Norway—one of the world’s leading experts in oceanography. Wilkins, undeterred, was ready to set off for the North Pole when he received a telegram from his wealthy industrialist sponsor, Randolph Hearst. Hearst argued that Wilkins should abort the expedition and try again the following year. In spite of his sponsor’s pleas, Wilkins departed for the North Pole. After a final stopover at Spitsbergen, the Nautilus finally set a course toward the polar ice cap. As they steamed towards ever-more-northerly latitudes, the crew members were reminded that they were piloting a submarine that was not originally constructed with such frigid waters in mind. Inside the hull, conditions steadily approached miserable levels as the temperature rapidly plunged. Despite the cold, the crew members began to deploy their experiments. Sverdrup, the oceanographer, utilized a specially-designed pendulum to measure the Earth’s gravity. He knew that gravity is not uniform, varying minutely from place to place—the closer one is to the Earth’s core, the stronger are the gravitational forces exerted, and the faster the pendulum should swing. As predicted, Sverdrup noticed how his pendulum swung faster in the polar regions than it did at Earth’s equator. Though measurements had been taken earlier that indicated that the Earth was not a perfect orb, it is in part thanks to Sverdrup’s work aboard the Nautilus that we now know that the Earth is oblate spheroid—a shape that is almost spherical, but with a slight bulge at the equator. Conditions aboard steadily worsened as the vessel approached the ice cap. The crew members’ visible breath created a layer of hoarfrost that coated everything inside as the temperature dropped below freezing. The crew had to constantly move around in order to stave off hypothermia, and morale sunk almost as rapidly as the thermometer’s mercury. Life within the Nautilus became a cold, miserable slog as the Arctic Ocean turned the submarine into a claustrophobic, refrigerated sarcophagus. There was little option but to endure, though some amongst the crew began to wonder whether they’d return alive if they attempt a dive. Would they really be able to spend several weeks underwater without freezing to death? Would they be able to surface at the North Pole to rendezvous with the Graf Zeppelin? Would the oxygen supply hold out, and would the primitive atmospheric scrubbers keep CO2 and other organic compounds at survivable concentrations? Nevertheless, Wilkins and his crew soldiered on with their experiments. Within the pressure chamber, they used a net to fish specimens of marine lifeforms out of the freezing ocean, curious to see what kind of creatures could endure such brutal cold. Much like Captain Nemo in Verne’s book, they were especially intrigued by the jellyfish they found—graceful, serene creatures that appeared wholly unfazed by the prodding of the bizarre bipedal mammals that have ventured down into their habitat. Crew members in the Nautilus galley. In his diary, Wilkins noted the displeasure of the crew: “Without exception, the others in the vessel wanted to immediately turn back.” Wilkins, not keen on being remembered as a failure, ordered preparations for a dive under the ice, including a final inspection of all onboard systems. The crew was meticulous, knowing that mechanical failure would in all probability result in the death of everyone on board. One crew member donned a diving suit and conducted a final inspection of the Nautilus’ exterior. When he surfaced, the news was dire: the two bow stern planes—instrumental in maneuvering the vessel underwater—had vanished. Mounted on either side of the propeller, they were meant to control the depth of the submarine when underwater. Without them, the already delicate operation of diving became unacceptably dangerous. Immediately, rumors of sabotage began to circulate amongst the crew. Had someone, fearing for his life, removed the stern planes so that the Nautilus would be forced to turn back? Or were they simply torn off by drifting chunks of ice? Unsurprisingly, the prospect of a prolonged dive beneath the ice became less than enticing to sailors who were cold, wet, and trapped within a vessel that appeared to have taken every opportunity to break down. Despite this, Wilkins and Sverdrup continued with their research. They made another landmark discovery when, analyzing samples of seawater, they realized that the waters of the salt-rich Gulf Stream reached much further north than previously thought. This, in turn, was a discovery that became key in explaining the relatively mild climate of the Scandinavian countries. Because of the missing stern planes, the first journey beneath the ice was a brief and shallow affair. While it was perhaps a less grandiose event than Wilkins had envisioned, he and his crew still became the first people ever to travel at any distance in a submarine beneath the Arctic ice cap. Upon surfacing, the crew discovered that the ice had sheared off the radio antenna, leaving the Nautilus without any means by which to communicate to the outside world. The ensuing radio silence did not go unnoticed for long, and within days rumors began to circulate within American newspapers that Wilkins and his expedition had met with a disastrous end. Wilkins, perhaps foreseeing the media frenzy brewing back on dry land, wanted to bring back evidence that the Nautilus has indeed dived beneath the ice. He set up a camera on an ice floe and filmed several takes as the Nautilus repeatedly submerged under the ice. The crew, meanwhile, finally ventured out onto the pack ice after having spent the better part of four weeks locked up in a freezing metal canister. The men set up a jury-rigged radio antenna, enabling Wilkins to send a transmission to Randolph Hearst in New York. Hearst was quick to reply, urging Wilkins to abort the expedition and informing him that the Graf Zeppelin would not be able to make it to the rendezvous at the North Pole. Worse still, Hearst also told Wilkins that he would be cutting all further funding for the expedition. It was dire news for Wilkins, who had invested almost all of his fortune in the expedition, and who now faced the very real possibility of personal bankruptcy, despite Lincoln Ellsworth’s continued financial support. With the looming possibility of financial ruin, Wilkins finally relented and, to the great relief of the crew, decided to call off his quest to reach the North Pole. The Nautilus turned around and set course back to Norway. After battering her way through a rough North Sea, the Nautilus finally limped back into Bergen on 20 September 1931. The crowd lining the harbor could scarcely believe what they were seeing; the rickety old submarine that left over a month ago—looking barely fit to keep the sea out—had returned, having travelled to the Arctic ice cap and back. Her final voyage through the storm-prone North Sea had inflicted irreparable damage to her engines, and the old submarine was spent. The crew radioed the U.S. Navy—still technically the owners of the Nautilus—with news of the vessel’s safe return. After hearing what condition the Nautilus was in, the Navy wisely made the decision that she was no longer seaworthy and should therefore be scuttled. Moments later, the Nautilus commenced her last dive as she was sent two hundred fathoms down to the bottom of the Byfjord, just outside Bergen. To this day, the wreck still rests lopsided in the silt, and one can just about make out the word “Nautilus” on her bow amidst the corrosion, barnacles, and encrusting marine fauna. After the Nautilus expedition, Wilkins once again partnered up with Lincoln Ellsworth on several expeditions to Antarctica. In 1937 Wilkins found himself back in the Arctic regions, commanding a joint Alaskan-Canadian expedition in search of the lost Soviet flying ace Sigizmund Levanevsky. As the world plunged into the chaos of World War II, Wilkins signed on as the Arctic Consultant to the U.S. Army, a position he kept even after the wartime years. Many years later, in 1955, the U.S. Navy received the world’s first operational nuclear-powered submarine, it too called the Nautilus. At one hundred meters in length and displacing over 3,500 tons dry, it was a true leviathan compared to Wilkins’ modestly proportioned vessel. With nuclear propulsion, lengthy voyages under ice were suddenly feasible, and in 1958 the USS Nautilus embarked on Operation Sunshine, the world’s first subpolar crossing. Wilkins himself never stopped dreaming of a subpolar crossing of his own. In October 1958 he met and discussed the idea with James Calvert, commander of the nuclear submarine USS Skate. But the dream was not to be realized. On 01 December, Sir Hubert Wilkins, aged 70, unexpectedly died in a hotel room in Framingham, Massachusetts. With those final words, the remains of Sir Hubert Wilkins were scattered across the icy wasteland, his last journey ending in the place that in life had so persistently eluded him. Written by Gustaf Hildebrand, copyright © 14 June 2016. Gustaf resides, for reasons unknown, in Sweden. He writes for Damn Interesting, has studied Information Design and likes to maintain the illusion that someday he'll be a successful science fiction author. Podcast sound design by Alan Bellows. Podcast narration by Simon Whistler. Edited by Melissa Wiley. Last updated 07 January 2019. A chilly yes. You are first. Love these articles. Strongly prefer American accent voice actors though. The voice actor for this podcast is good at his job, it’s just hard for me (a midwestern American) to follow a complex narrative through a foreign accent. Again, Mr. Whistler does a great job. It’s not him, it’s me. One minor error in the text. The bow planes of a submarine are located in the BOW and not on either side of the propeller which is in the STERN of the boat. Thanks for a very, very enjoyable and informative piece. Wonderful journey. As a child in my home in Greenwich Connecticut in our attic was a spring wound powered Victrola with Victor’s Dog and logo “His Masters Voice” . On this Victrola we would play a record of an Italian explorer (Umberto Nobile was an Italian aviator, aeronautical engineer and Arctic explorer. Nobile was a developer and promoter of semi-rigid airships during the period .) who either sailed or flew an airship into or toward the North Pole. In my memory I can still hear the sound of the wind as recorded. We played the record hundreds of times just to hear the howl of the wind. That’s when Men were very bent on hardship to obtain a Goal. My interest in Wilkins was piqued some time ago by an inquiry I received via a website that I run for a 19th-century mountain gold-mining ghost town in the foothills of the south-east Australian Alps. A woman had written to me asking after “Susie Evans”, who’d been a playmate of her grandmother and often sung with her at school concerts. She’d been told that she “married a politician and moved to Sydney”, but the reality was that she’d become a Melbourne showgirl, married (and soon divorced) a man named Oscar Bennett in 1915, studied voice under Dame Nellie Melba, and sailed off for a career in opera at La Scala in Milan. She changed her goals en route, and instead became a celebrated Broadway showgirl, in which capacity she was introduced to the famous explorer, whom she eventually married at Cleveland Registry Office in late August, 1929. Neither got in the way of the other’s career all that much, and you get the impression that that arrangement suited them both quite well. She purchased the farm on which they lived in N-E Pennsylvania, and died some 16 years after her husband, in a nursing home in California, having had no children. Her ashes were also scattered at the North Pole, from the nuclear submarine USS Bluefish, on 4 May, 1975, as a further mark of respect by American submariners. Wilkins was a strange man in many ways. When knighted in 1928, for example, he foreswore being called Sir George Hubert Wilkins, the name by which he was christened, and styled himself instead as “Sir Hubert” in a craven token of excessive deference to England’s then King (South Australians can be like that sometimes). For a further and more extensive treatment of his life and times, I would recommend Simon Nasht’s “The Last Explorer” (published by Hachette Australia, 2007). Reading about his earlier exploits, you will be left with the impression that his crash-through-or-crash attitude often meant that he was a very dangerous man to be standing too close to when the balloon went up. Greatly enjoyed the read, as always, damn interesting stuff. Very interesting…enjoyed reading it and gaining knowledge of submarine civilian use. Noticed one minor error…stern planes control the subs angle when diving while bow planes control the depth. This early and rickety contraption for sailing beneath the waves was, however, destined for greater things, as she became the first machine to take humans past—or rather, beneath—one **** the last great unexplored frontiers the Earth has to offer. Other then that typo the article is well written. Yet another great article that I somehow missed in 2016. I don’t see how that’s possible.